A new Life-Cycle Assessment, or LCA, of the long-term environmental impact of EPDM shows that it performs significantly better than comparable roof assemblies. Equally as important, the study — based on the most up-to-date data supplied by industry and public sources — reports that the environmental impact of EPDM is lower than previously thought. LCA is an analysis of the environmental aspects and potential impacts associated with a product, process, or service. It is also a criteria that is growing in importance and for assessment of environmental impact. The study was conducted on behalf of the EPDM Roofing Association (ERA) by the GreenTeam, Inc., a strategic environmental consulting firm based in Tulsa, Oklahoma, USA. That specialise in building industry issues The LCA included all inputs associated with the manufacture and installation of various roofing systems, including EPDM, TPO, PVC and SBS modified bitumen. At only 6.93 kg CO² per square foot, EPDM’s GWP is nearly half the nearest material. As a forward-thinking organisation that stresses environmental stewardship, EPDM Roofing Association (ERA) is keenly aware that LCA is likely to become an increasingly significant factor within the building industry in the future. The study conducted by the GreenTeam is evidence of this awareness. At the same time, significant progress has been made to establish the specific criteria for an unbiased playing field to create effective LCA studies. In the most recent LCA study conducted by the GreenTeam, all outputs and impacts were calculated using SimaPro LCA software. Impacts were summarised using the categories and unit measures of the U.S. Environmental Protection Agency TRACI model (Tool for the Reduction and Assessment of Chemical and other environmental Impacts). All materials studied were assumed to provide equal service lives, so the basic impacts were unadjusted for service life, and all impacts were calculated based on one square meter (m²) of installed membrane. Energy-related categories such as global warming appear to offer the greatest relevance. GWP as measured by kilograms of CO²-equivalents varied from a low of 22.4 kg per square foot (fully adhered white non-reinforced EPDM) to a high of 81.8 kg per square foot (140-mil smooth surface SBS). The relevance of the global warming category is further supported by the degree of differences exhibited by the membranes studied. 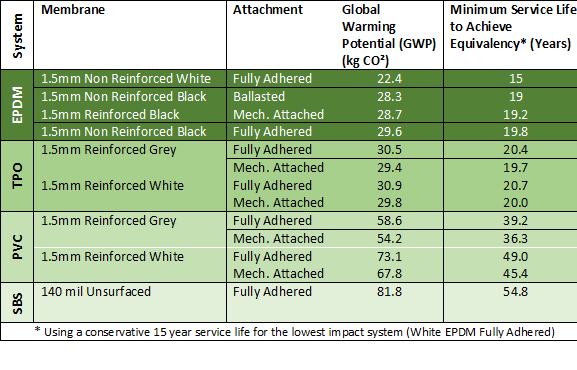 As an example, the global warming potential of a white PVC or smooth surface SBS membrane is more than twice that of a black EPDM or white TPO roofing membrane for all system types studied. One of the most interesting findings in the study is the minimal role played by attachment method in determining overall environmental impact. As an example, the various attachment methods studied (ballasted, fully adhered, mechanically attached) appear to affect overall GWP by less than 4% for EPDM and TPO and less than 7% for PVC. This lack of demonstrable difference suggests that the selection of the most suitable application method should be based on other factors such as potential longevity, ease of repair, etc. For the membrane colour appears to play little or no role as a differentiating factor between material types. As an example, the GWP for a fully adhered grey 60-mil TPO membrane (30.5 kg/ft²) is essentially identical to the GWP for a similar white 60-mil TPO membrane (30.9 kg/ft²). For EPDM membranes, however, a fully adhered black 60-mil EPDM membrane exhibiting the lower 29.6 kg/ft² result. At the conclusion of the study, the GreenTeam identified the number of years each roof system would have to perform in order to negate their GWP created during their manufacture and installation. This service life equivalency was calculated using a service life of 15 years for the system with the lowest GWP — fully adhered white EPDM — as a benchmark to compare all other systems. It was found that all four EPDM systems in the study exhibited the lowest service life equivalencies among all tested systems, which means an EPDM system requires less service time to become carbon neutral than its counterparts. Combine the low equivalency ratings with a service life that can often exceed thirty years, and it’s easy to see how EPDM can be considered one of the most sustainable and environmentally friendly roofing systems. This table shows the comparison among widely used low-slope roofing systems. The LCA conducted by the GreenTeam was based on a cradle-to-building approach. As a consequence, no impacts were identified or measured for activities that occur during the service life of the roofing system (routine maintenance and periodic repair or renovation) or at the end of service life (removal, disposal and possible recycling). Although many of the activities not addressed by this study such as routine maintenance and periodic renovation generate relatively small environmental impacts, their value in extending service life may be much more important than their incremental impact contribution. For a roof system designer, the opportunity to reduce overall environmental impact by extending useful service life implies that material or design features supporting this opportunity should receive considerable attention. Such features may include the ability to accurately predict maintenance and repair requirements, relative ease of repair, and the ability to remove and replace selected roof system components.